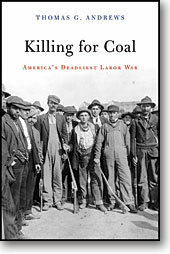 Major Publications: Andrews is the author of Killing for Coal: America’s Deadliest Labor War. Cambridge, Mass. : Harvard University Press, 2008, winner of the 2009 George Perkins Marsh Prize for Best Book in Environmental History, American Society for Environmental History; 2009 Bancroft Prize, Columbia University; 2009 Vincent P. DeSantis Book Prize, The Society for Historians of the Gilded Age and Progressive Era; 2009 Colorado Book Award, History Category; 2009 Spence Award, Mining History Association; Honorable Mention, 2009 Hundley Prize, The Pacific Coast Branch of the American Historical Association; Finalist, 2009 Clements Prize, Southwest History category, Clements Center at SMU; Noteworthy Book in Industrial Relations and Labor Economics, Industrial Relations Section of Princeton Firestone Library; 2009 Caroline Bancroft History Prize, Denver Public Library. Andrews is also the author of numerous scholarly journal articles, book chapters and reviews including among others: “Contemplating Animal Histories: Politics and Pedagogy across Borders,” Radical History Review 107 (Spring, 2010): 139-165; “Making Meat: Efficiency and Exploitation in Progressive Chicago.” Organization of American Historians Magazine 24 (January, 2010): 37-40; Flannery Burke and Thomas Andrews, “The Five Cs of History: Putting the Elements of Historical Thinking into Practice in Teacher Education.” Pp. 151-167 in History Education 101: The Past, Present, and Future of Teacher Preparation, eds. Wilson J. Warren and D. Antonio Cantu. Charlotte, N.C.: Information Age Publishing, 2008; “What Does It Mean to Think Historically?” Perspectives: The Newsmagazine of the American Historical Association (January, 2007): 32-35l; “‘Made by Toile’? Tourism, Landscape, and Labor in Colorado, 1858-1917.” Journal of American History 92 (December, 2005): 837-863; “Turning the Tables on Assimilation: Oglala Lakotas and the Pine Ridge Day Schools, 1889-1920s.” Western Historical Quarterly 33 (Winter, 2002): 407-430; “Tata Atanasio Trujillo’s Unlikely Tale of Utes, Nuevo Mexicanos, and the Settling of Colorado’s San Luis Valley.” New Mexico Historical Review 75 (January, 2000): 4-41. U. S. Environmental Protection Agency, Science to Achieve Results (STAR) Graduate Fellowship, 1999-2002. Formerly Assistant Professor, Department of History, California State University, Northridge, Fall, 2003-Spring, 2007. In less than a week, I was set to give my first-ever conference paper, before the annual meeting of the American Society for Environmental History. A very generous friend who was already out of graduate school and teaching had made room for me on a panel devoted to exploring the implications of Richard White’s important 1994 essay, “‘Are You an Environmentalist, or Do You Work for a Living? '” The conference organizers had slated the session for a room that sat at least a hundred, not because anyone wanted to hear a Ph.D. candidate from Wisconsin blather on about coal-mine explosions, but instead because my fellow panelists were fast making names for themselves. More important still, Richard White had kindly agreed to comment on the papers. White’s “Are You an Environmentalist” had grabbed me the first time I read it (it has yet to let me go). I found myself deeply persuaded by White’s central claim: that environmental historians can learn a lot by taking seriously work and those who perform it. The piece taught me the best kind of truth–a simple truth of seemingly boundless explanatory power: Labor, White reminds us, has always encompassed many of the core practices through which human beings have arrived at a knowledge of nature. I don’t know what they put in the Koolaid that I imbibed in seminar at Wisconsin, but like most graduate students there and elsewhere, my way of paying homage to the profound influence White’s essay had had upon me (and, for that matter, the impact that his whole corpus of scholarship had made upon me since I first encountered The Middle Ground as an undergraduate) was to lash out with that peculiar brand of Oedipal rage that combines the worst aspects of adolescent impudence and twenty-something earnestness. In the months leading up to the ASEH, I must have read “Are You an Environmentalist” at least six times, each time slicing and dicing the essay with my critical knives sharpened to a razor’s edge. My near-compulsive re-reading had filled me with unwarranted confidence. I told myself that I had found every weakness, every contradiction, every leap of logic, every hole in White’s argument. I could not wait to tell the assembled lights of my discipline about all the things White had gotten wrong. I envisioned myself delivering a devastating critique; I imagined the verbal combat that would ensue as White, one of the greatest historians of his generation in my estimation (a conviction that I hold even more strongly today) devoted his comment to parrying my attack. Those who have seen Richard White engage in debate will understand why this thought was not entirely comforting. At the first historical conference I had ever attended, in fact, I had watched White pretty much eviscerate two junior scholars when they tried a stunt very similar to the one I was plotting. I attempted with little success to maintain my confidence. I told myself that I was smarter than the pair I had seen White tear up. Besides, my critique was as persuasive and elegant as theirs had been tendentious and awkward. Doubt, thank goodness, remained. I sent my advisor, Bill Cronon, a draft of the diatribe I had assembled. Bill gave me very clear and direct advice: Don’t be an idiot. File the paper away and write a new one that focused instead on presenting my own research findings. Part of me evidently had a death wish and welcomed the heady risk of committing career suicide at such an early stage. That part of me felt censored by Bill and frustrated at the ways in which professionalism seemed to constrain intellectual exchange within the academy. But overwhelming the compulsions seeking to push me to the edge were cooler, more cautious impulses. And so I pulled back to deliver an altogether safer paper. Bill had averted my juvenile plan. In the process, he spared Richard White the trouble of deciding whether to give me the dressing-down that I deserved, or to look graciously away from my impertinence. If one of my own students were to concoct a similar stunt, I would undoubtedly provide the same advice. For all this, though, I can’t help feeling a little uncomfortable with the hard lessons this incident imparted-that our profession is inextricably hierarchical in nature, that some historians are simply smarter and more highly-skilled than others, that what I can do and how I can do it depends at least to some extent on how well I know and keep to my place. With apologies to Borges, I had always imagined academe as a sort of paradise. This was an unusually outrageous delusion on my part; as an academic brat, tales of departmental infighting, administrative folly, and student futility were nightly topics of conversation at the family dinner table. Choosing to hold my fire against Richard White turned out to be a critical first step in my discovery that the historical discipline can offer no real place of grace, no true escape, from the world as it is–not a happy discovery, I know, but perhaps a necessary one. “This truly is the highest honor that professional historians bestow upon a work in U.S. history. I imagined that I’d spend my entire career pursuing this goal without ever achieving it and I’m simply tickled to be in such incredible company. I’m a Colorado native, but I never knew anything about Ludlow until I was in graduate school. When I first learned about the massacre, I was appalled that such killing had occurred and I was drawn to the opportunity it provided to bring together a much bigger set of stories: about the deep-seated dependence of westerners on fossil fuels, about the coal mines that generated so much conflict in southern Colorado, and about the men, women, and children who came from around the world to work in and around the mines.